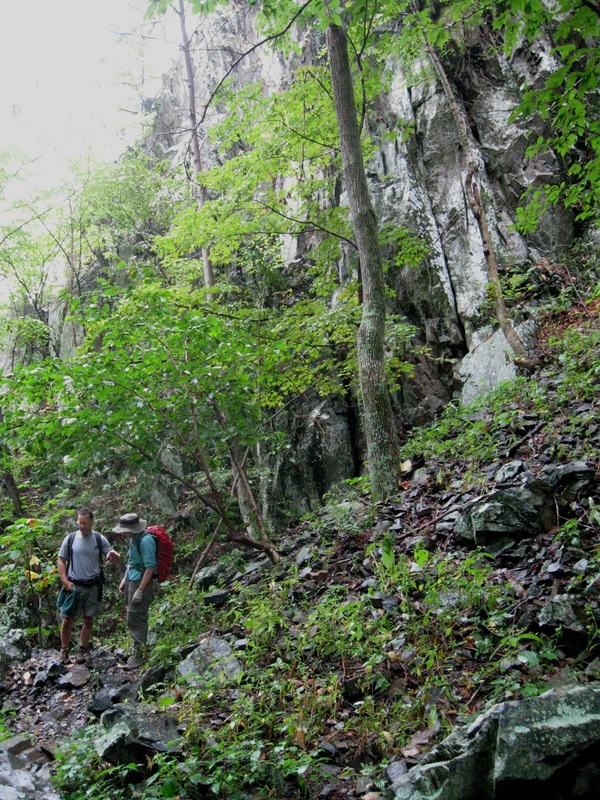 To commemorate the 25th anniversary of the Charlottesville Chapter, PATC, we repeated the first hike of the chapter—a circuit hike starting at Blackrock Gap. As fits a historic event in Charlottesville, the majority of those present were born in Virginia. And leader John Shannon, who was on that first hike, has lived longer in Virginia than anywhere else—even though born in Australia. 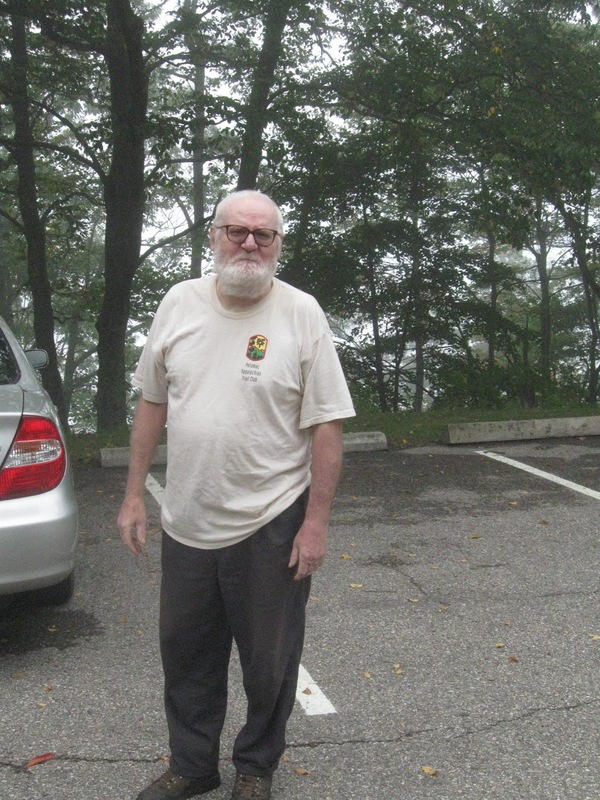 At Blackrock Gap, we were pleased to see Larry Linebrink, a member of the chapter from its founding days who was recently awarded a Silver Service Award from the National Park Service for 25 years of service to the Appalachian Trail. We talked about other people from the early days, some of whom are still in the area. 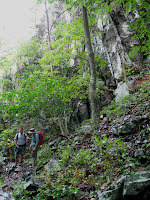 Leon Gorman is the only person among the original members who has hiked with us in recent times. Then Larry left to help another trail overseer, starting work toward a Golden Service Award for 50 years service. We started the hike in fog, and most of us were glad we wore long pants. Ken Moss and John carried saws because of a report earlier in the month of trees down near Blackrock. 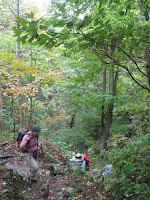 We did come across some small fallen trees, which we cut away from the trail. At Blackrock, we did not climb the rocks because of the fog and instead headed toward Trayfoot Mountain. 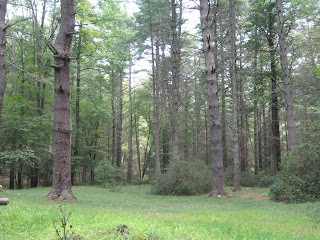 Along the way, we saw that exotic invasive plants have reached this area. While we were heading down Trayfoot Mountain, the fog lifted. 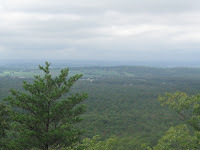 By the time we reached our west-facing lunch spot, we could see into Shenandoah Valley. John’s pumpkin cake was so good, that at least half of us ate two pieces of the delicacy, which led to conversation about Krispy Kreme and Spudnuts donuts. Soon after we started back on the trail, lunch expert Marian Styles pointed to a flat rocky overlook facing the main ridge of the mountains, a better spot for lunch than the one we’d chosen. As we walked uphill along Paine Run, Don Davis carried out an abandoned foam pad. Closer to the top, Sue Tansey summed up the feeling that after looking at the site of the former Blackrock Hotel once, there was little to gain in looking at this area again, so we continued up. 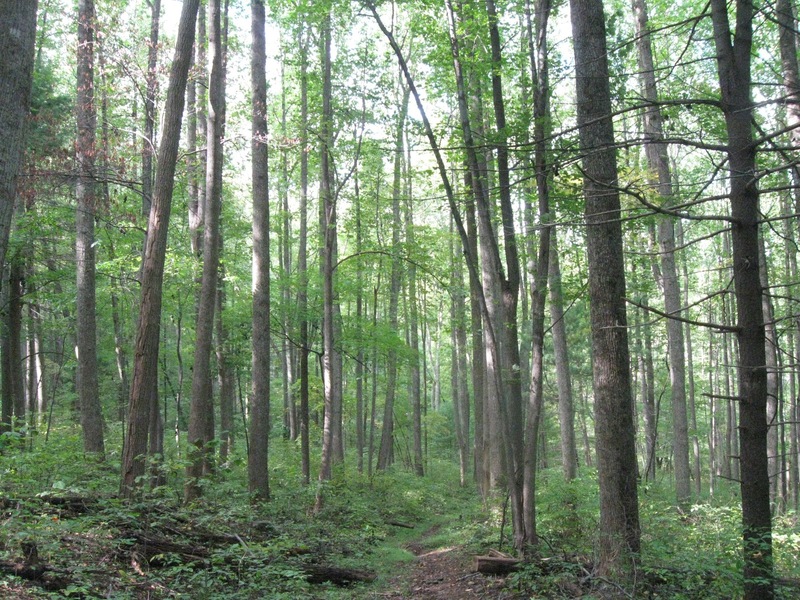 After completing the 10 miles, Dan Funkhauser asked about a post-hike beer, and we discussed a post-hike dinner, but complications from football traffic in Charlottesville and the lure of watching a game on TV helped nix the idea. We got back to town at 5 p.m.
How Charlottesville PATC started: In 1986, Rita Wyatt Beard moved to Charlottesville to start a chapter of PATC, in part as her way of recovering from being violent-crime victim. She sent invitation letters to PATC members in Charlottesville, and sat on the appointed evening in the Unitarian Church wondering if anyone would show up. Twenty or so people did, including Howard Parsons, who offered to lead a hike a week or two later. 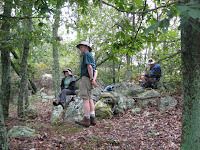 On Sept. 24, 2011, we repeated the route that Howard led 25 years before—the first hike of Charlottesville Chapter. Ten years after founding the Charlottesville Chapter, Rita Wyatt-Beard died relatively young from cancer after returning to Colorado. Nevertheless, the spirit of her policy of having a Chapter activity every Saturday has endured for 25 years. Yet ’twas so nice to hike again with our pal. How delightful it was to arrive at the high school parking lot and see former hiker/hike leader Valerie Lopez geared up to join us! We haven’t hiked with Val for 5 years, and her presence was today’s special treat. John Shannon and Iva Gillet served as hike leaders, and in addition to Val, they were joined by Andy Willgruber, Dan Funkhauser, and yours truly (Marian Styles). Having two hike leaders would have allowed for two hikes—and today’s locale offered 6-, 8-, and 10.5-mile options—but because all six of us wanted to hike at least 8 miles, we hiked as one group. 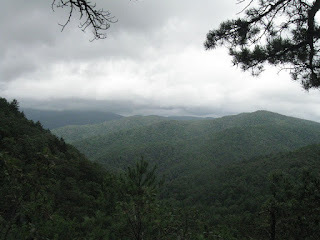 Maybe forecast rain had kept some people away, and we did hike through a light rain for the first half-hour. After that, though, we peeled off rain coats and enjoyed mostly overcast skies yet pleasant temperatures. The Little Devil’s Stairs part of the hike combined beautiful natural features with an uphill workout. In fact, as Dan pointed out, this hike proved a good combination of ascents (about 2,500 feet throughout the day), descents, and level ground. We were enjoying the hike so much that when the decision point came for 8 or 10 miles, we chose the 10+-mile version: all the better to fully enjoy the area’s spectacular geology and peaceful forest. Plus, agreeing to the distance gave Andy (and others) an excuse to blame Iva should the length prove a bit much. We saw few other people during our route. One place that did have people was the Range View cabin, where we were hoping to have a dry place to sit for lunch. Since the cabin was occupied, we walked a bit further and pulled out ponchos and plastic bags to sit on during lunch. Having to sit on the ground was mitigated by the yummy pumpkin bread that John passed around. Reinvigorated, we hit the trail. 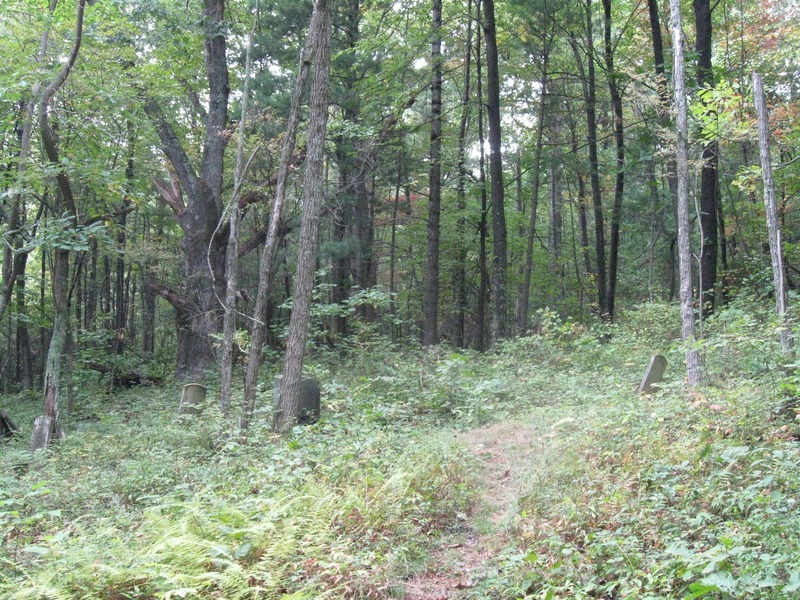 The route had been decorated by an abundance of colorful mushrooms, including a bouquet of amazing yellow-orange mushrooms growing up in a tree beside the Bolen Cemetery. 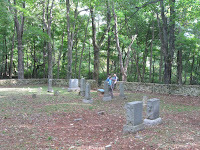 Speaking of cemeteries, this hike featured two. Several of the dates on grave markers in the Bolen cemetery showed that the influenza pandemic of 1918-19 had probably cut short the lives of some who lived here before the park was created. Back at the cars, Iva didn’t get any guff for having lobbied for the full distance. In fact, we all agreed that it had been a fabulous hike, and we decided to extend the fun by stopping for dinner on the way home. We ended up at Pig and Steak in Madison, where in addition to B-B-Q, sweet potato fries, hush puppies, and fried mushrooms, we also pigged out on fried broccoli that Val had ordered in honor of the absent Leon Gorman. Meanwhile at Dunlodge, Don Davis, Thomas and Mary Jorgensen rebuilt some steps to the cabin, while Tom Johnson repaired some trail on the property. The long-awaited relocation of the Appalachian Trail from Beagle Gap up Little Calf Mountain broke ground today. Crew leader Don White arranged for excellent weather, warm, but not hot, and no rain. The first clearing work was on Sept. 3, when Andy Willgruber and Don Davis mowed Little Calf Mountain summit and some areas north and south of the summit that will become trail. 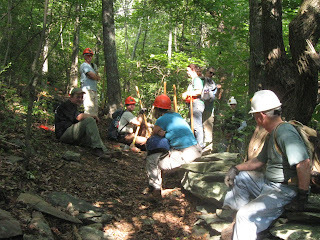 On Saturday, trail builders met at Beagle Gap around 9 a.m. to collect tools, hard hats and directions. The most-used tools were pulaskis and McLeods to cut out a near-level trail in the side of the hill. We used a couple of rock bars to move some large rocks. A sledge hammer to knock off pieces of rock would have been helpful, but perhaps not worth the effort of carrying. Later I discovered there is a product named “light-weight sledge hammer,” not available at the usual home improvement store or even amazon.com, but perhaps we will find them at the Shops at Stonefield when they open. For $60/pound, you can reduce the weight of a sledge hammer by 1.5 pounds. Other useful hand tools included loppers for a little clipping and leaf bags. The first rule of the day was that no one was going home in a body bag, so in addition to what people often wear for trail work, hard hats were required. One person said it was the first time she had to wear one, and thought it a good idea. The workers came from near and afar. One trail maintainer from Missouri was in the area and spent part of the day helping. 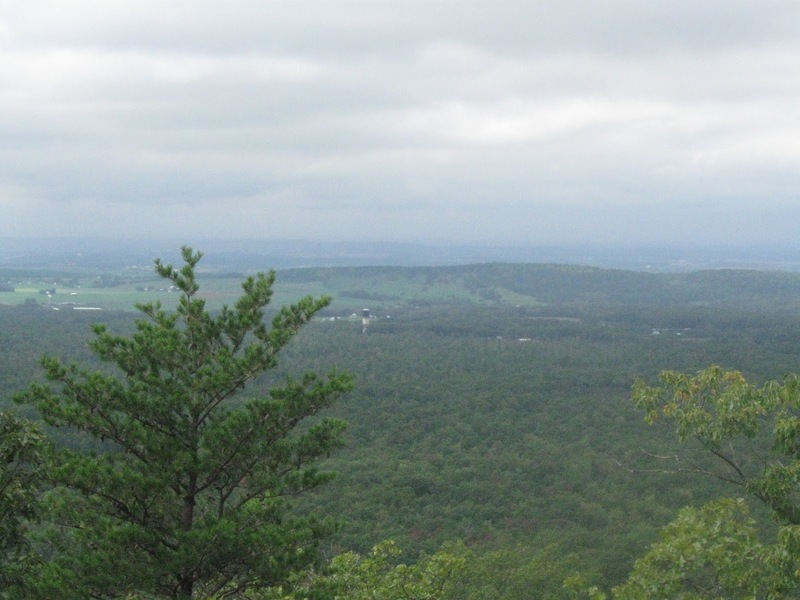 He invited others to join him at Springer Mountain next February, or to see him in May when he passes through this area on the Appalachian Trail. A number of people were from northern Virginia and Maryland, and seven were from the Charlottesville area. Andy used the field mower to cut a wide strip through the grass near Beagle Gap. 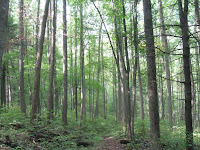 Don was the chainsaw operator, cutting some large, dead trees in the way and other small trees obstructing the trail. Excitement ensued when a large log rolled down hill but was stopped by a tree. Mostly people dug into the side of the hill to make a trail bench. This is a fairly different world from repairing existing trail, requiring deeper digging and cutting more roots. In spots, we had to remove many rocks, some large, many small. One observation was that crew leader Don White took the long view by building the best trail he can--one that avoids steep inclines and is free of rocks that might trip people--because people will use it for decades, so at times there was a lot of work on small sections. For instance, there was the rock sticking up an inch above ground where it could trip people, but took a lot of digging to move the foot of rock below the surface. A couple of times there was a choice of an easier-to-walk path for the next 15 feet, or an easier-to-build route; the choice was the easier-to-walk and less erosion-prone route. The benefits of less erosion and less uphill will last for decades, after the extra time and effort for construction are forgotten. One person asked why we did not use an existing abandoned trail, or perhaps road, instead of digging new trail. The main reason is that the existing path stays level, and then requires a relatively steep uphill, unlike the new trail which gently climbs along the face of the hill. 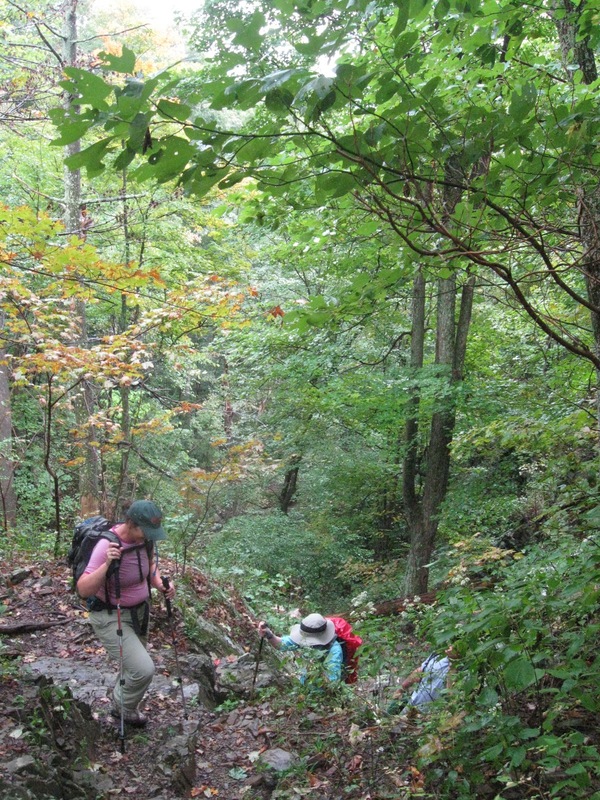 As on other trips, some people made beautiful wide, flat trail, while others dug trail that was more wilderness-like. A sign that the area is meant to be trail is that some exotic invasive plants are already growing, although they have not yet taken over the area. At lunch on Saturday, we heard of the health benefits of chia. The advocate is 82, has walked 500 miles this year, and plans more next year, and told of us several problems that improved after eating chia. Bill Holman distributed dark chocolate treats, and I passed out chocolate (contains flavenoids to neutralize free radicals) babka with a mix of dried fruit. Toward the end of the day, the last task on the trail was scattering leaves over the bare earth to reduce splash erosion. When back at the vehicles, it was time to clean tools, a new experience for some, and cool drinks from crew leader Mark Gatewood. Some people headed home (a few returned Sunday) and half the crew went to spend the night at Schairer Trail Center with dinner by Mary and Thomas Jorgensen, known to some from work on Dunlodge Cabin. On Sunday, there was some crew turnover, with some people from Blue Ridge and Bridgewater Colleges. Although there were four Ph.D.s, we accomplished some trail building. 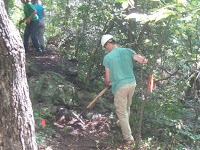 Some of the new crew showed that trail workers can be under 40, even under 30. Don Davis spent much of his time using a brush cutter to reduce the effort of clearing shrubs from the trail further uphill, where there is less of the time-consuming side hill trail construction. Working with a trail crew comes with benefits. One is getting a free T-shirt. Another is the social contacts and sometimes free access to people who know useful things. 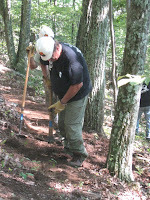 We have Don Davis who knows how to repair most things used by trail maintainers and house owners. 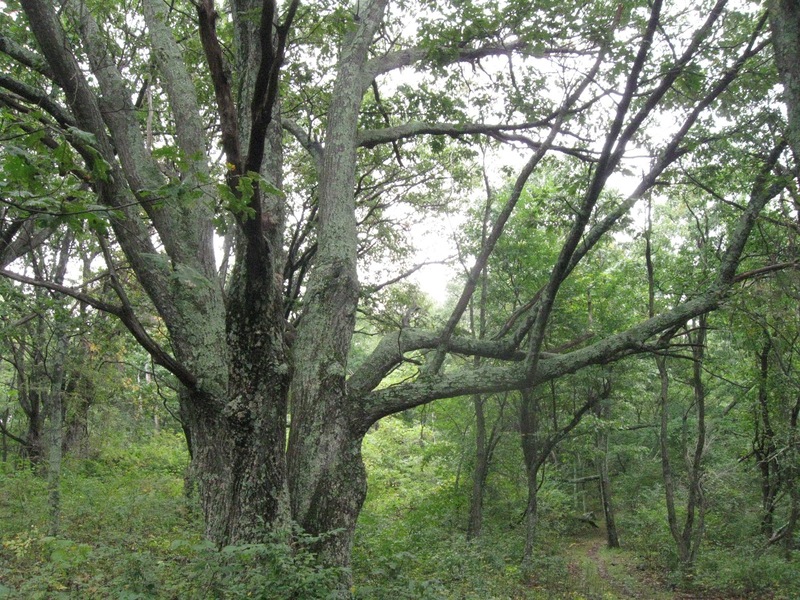 Sunday’s learn-something-new-every-day came from talking to a teacher of arborists, who explained that some tree care practices ignore the trees’ hundreds of millions of years experience in survival. Perhaps the biggest benefit of trail work, though, is seeing how people will spend hours getting dirty, tired and sore to preserve one of America’s treasures. 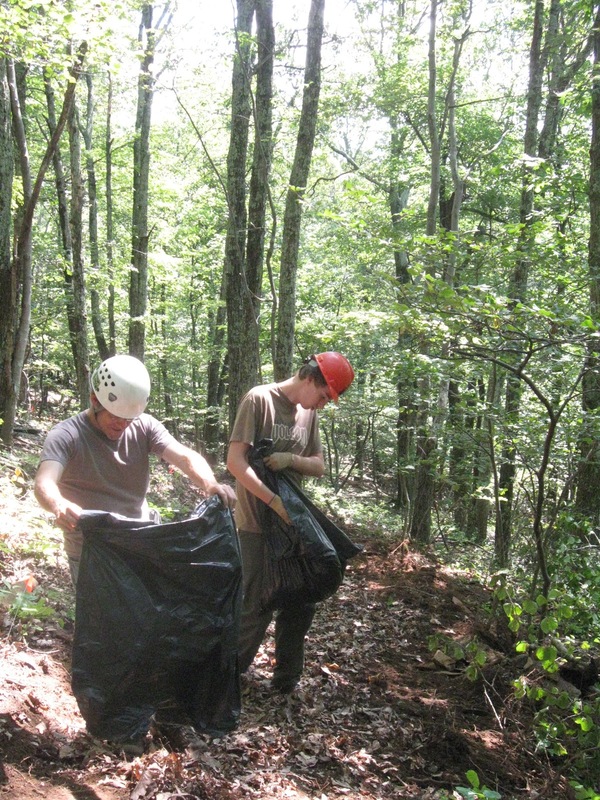 Although this was a holiday, some members of Charlottesville Chapter were looking after hiking areas. On Friday, Don D and Andy W drove the PATC field mower to the summit of Little Calf Mountain to mow the cleared area, and what will soon become sections of Appalachian Trail. Part of the road Andy uses to reach the summit will become AT, and is wider than the standard AT corridor to accommodate his truck. Then they went down the hill a little way mowing what will soon be Appalachian Trail, and then at the base of the mountain near Beagle Gap, mowed a path to lead from existing AT to the new section. 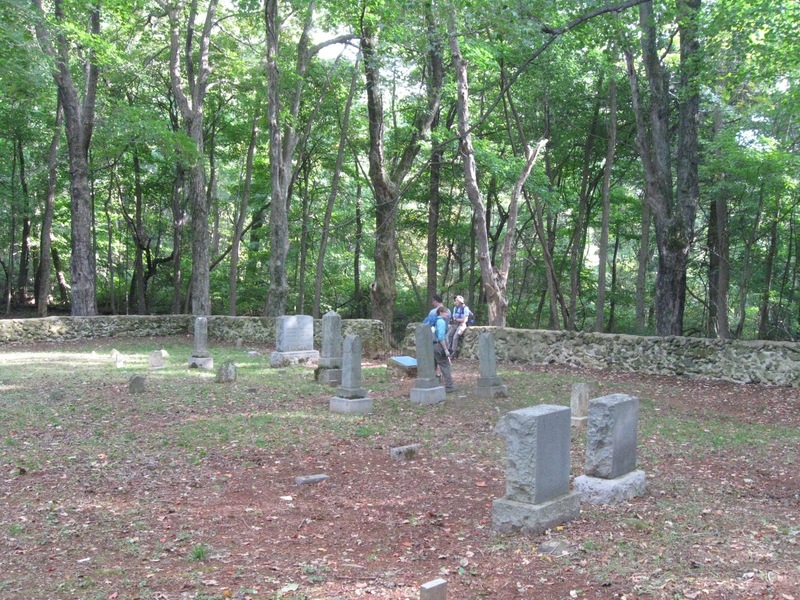 On the 4th, I went to tidy up the ends of the Chapter’s section of AT at McCormick Gaps. 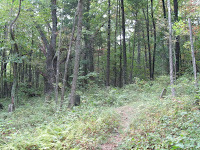 At McCormick Gap, the water draining structures have worked, although a couple were full of material washed down the trail, perhaps because the dry weather allowed stones to come loose so that they were easily washed downhill. I removed some newly sprouted invasive oriental ladys thumb, but did not get as far as a previous trip, and continued efforts to make a nearby bittersweet patch look eliminated, until next spring when it will regrow. I did not reach that point, but got closer. At Rockfish Gap, drains were in a similar state to McCormick Gap, and the first few feet of trail needed some regrading. I was happy with the results of what the chapter has done in the last several years to control erosion at the trail ends. I thinned out some bittersweet, and as at McCormick Gap, noted that nearly all plants were regrowth from roots left in the ground after breaking off when we pulled the rest of the plant in previous years.. It was progress, but not yet victory. 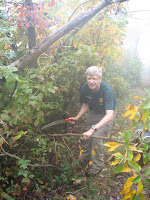 On September 5th, I learned that Larrry Linebrink recently received a silver service award for 25 years of service to the Appalachian National Scenic Trail. 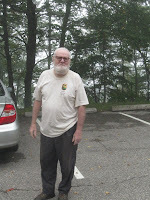 Larry was an early member of Charlottesville Chapter, and District Manager for the Appalachian Trail in the South District. In recent years, we have occasionally seen him at major trail projects. Larry had been actively involved in service to the AT at least since the formation of the chapter. 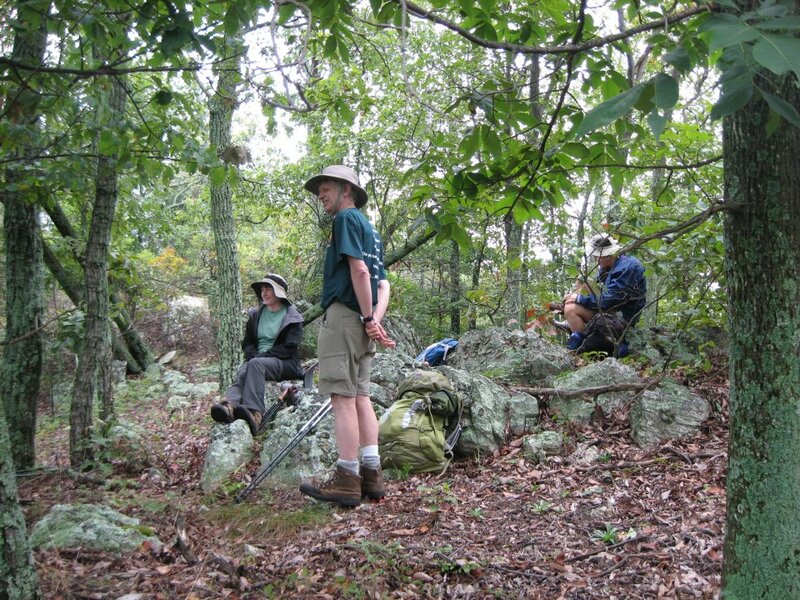 This means that this year, two member of the Chapter, Larry and myself, have been maintaining trails since the Chapter was founded, and recognized by the National Park Service with silver service awards. Then Flying McLeods Al and Andre Dahler were listed as volunteers of the month in the September PA. Ever since the Flying McLeods started, they have been present every trip but the most recent. Some years ago while living in the area they helped the Charlottesville Chapter with trail work, but after moving to the Shenandoah Valley, they have worked with SSVC. Seven humans and one dog from Charlottesville were not deterred by the description of the circuit hike along Road Hollow, Jerrys Run and Ramseys Draft trails with its disappearing trail, stinging nettles, poison ivy and stream crossings. At the trail head we met Bryan B and Greg F whom we had not seen for a while. 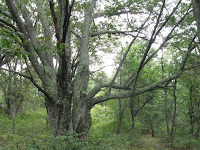 Greg’s presence was a relief to me because as expected, he had the trail recorded in his GPS. Our mildly muggy ascent on Road Hollow trail was as expected, and at the end, Leon G and canine companion Bailey turned around because Bailey was getting hot. As usual, we stopped at the site of Sexton Cabin, built by PATC. 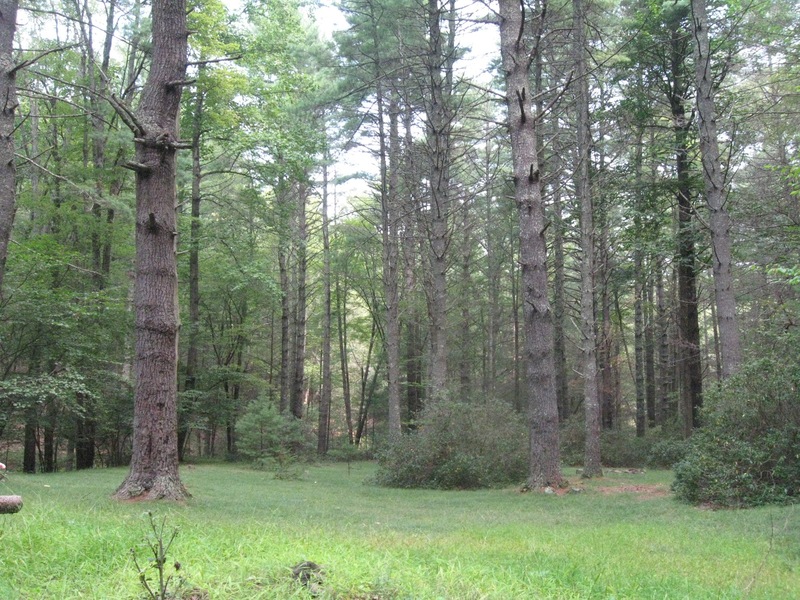 The September 2011 PA has the story of its two constructions and deconstruction., where PATC cabin overseer Don D was surprised to find a foundation in addition to the chimney. Some people decided that the free radical scavengers in lemon raspberry dessert were insufficient to protect them from the expected nettles, and added legs to their shorts, and by then only one person had bare legs. 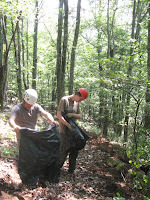 Warning of windy and wet weather from hurricane Irene probably kept away some people, but four trail and trail lands maintainers came to take a hike. Lindsay B did not realize his offer to drive included driving through fog. Our trip downwards to the creek found a little water, and after a climb to the waterfall, there was still minimal water flowing, despite the grey skies. As usual, we took a loop around to get to a rocky above the falls for lunch. Andy W labeled the cranberry oatmeal food more healthy than normal. On our way to Blue Ridge Parkway, we met a couple of young families, who had evacuated from Virginia Beach area, and came hiking in the beginnings of a storm. Along the Slacks Trail, we saw that someone had done a lot of digging to make the trail easier to walk, and improve the drainage, although John S thought that building some of the drains a little differently would have improved their efficiency. Just as we reach the end, real rain started. Ken M abandoned his plan to sample beer at Devil’s Backbone, and Andy had decided to skip the concert because of forecast wind and rain, so four of us headed back to Charlottesville, arriving much earlier than normal.